VENOM #8 is a beautiful love letter to Flash Thompson’s time as Agent Venom. 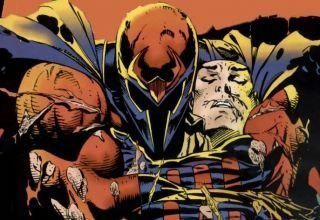 Donny Cates shows us what Eddie thought of Flash and how his death affected both him and the symbiote. He does this marvelously. Iban Coello really captures the raw emotion Eddie feels when giving Flash his eulogy. This is a truly beautiful issue. 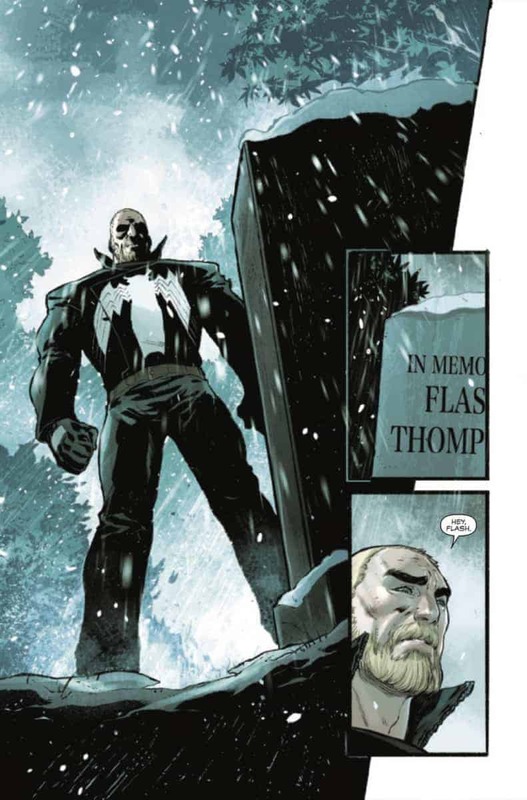 In VENOM #8, Donny Cates addresses an unanswered question: what was Eddie Brock’s reaction to Flash Thompson’s death? As usual, Cates does so with his fantastic storytelling prowess and his flair for great dialogue. 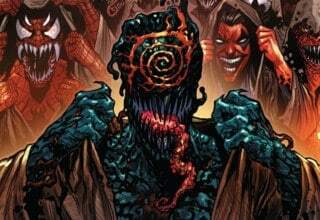 Still held captive in the Maker’s headquarters, Eddie reflects on his symbiote’s connection to Flash and Eddie’s place as the symbiote’s second favorite host. We also learn a huge new secret about the Klyntar race. Artist Iban Coello deftly captures Eddie’s complex emotions while he eulogizes Flash, making this issue quite emotionally resonant. This much-needed issue shines as one of the best issues of the entire series. In the last issue, we learned that Eddie Brock was captured by the Maker after his symbiote lost its sentience. Now, the Venom symbiote is nothing more than a mindless creature, reacting to Eddie’s subconscious thoughts. The Maker forcibly enlists Eddie to help him find who stole his sample of the symbiote dragon Eddie killed. 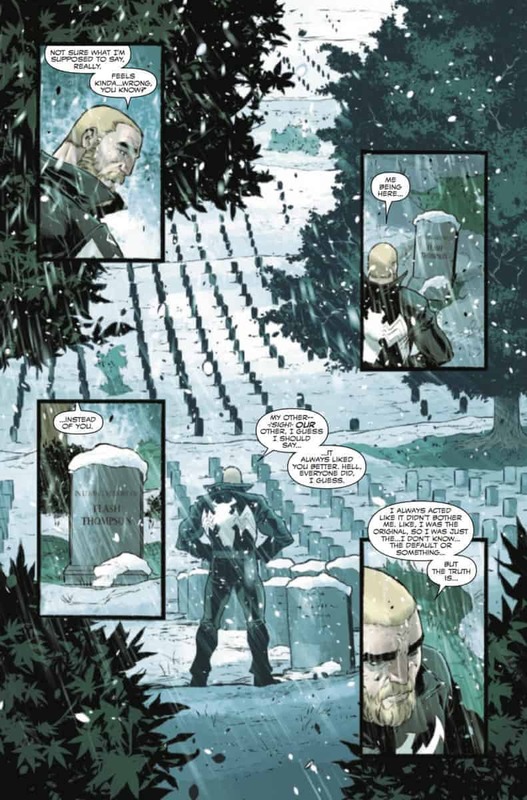 In VENOM #8, the Maker lets Eddie visit a holographic gravesite for Flash Thompson. In the pages of AMAZING SPIDER-MAN, Flash sacrificed himself to help stop the Red Goblin. Eddie hadn’t had a chance to really contemplate Flash’s death. 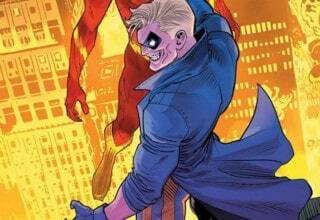 He bemoans that Flash was always the symbiote’s favorite host, as well as most other people’s favorite Venom. Eddie admits that he couldn’t handle being second best. 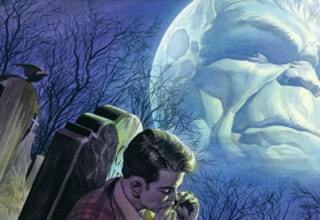 After a bit, the Maker ends the hologram and lets Eddie know a secret about the Klyntar. VENOM #8 page 3. Image courtesy of Marvel Entertainment. Apparently, each symbiote keeps a codex of DNA from its host in order to share their information with the other Klyntar on their home planet. The Venom symbiote hasn’t had a chance to take Flash’s codex back to its planet since Eddie got the symbiote back, so the Maker obtained his codex. However, it’s not enough information to study the Klyntar, so the Maker asks Eddie to desecrate Flash’s grave. He needs more of Flash’s organs in order to study it properly. Will Eddie go along with this? And what does the codex entail? Read VENOM #8 to find out! 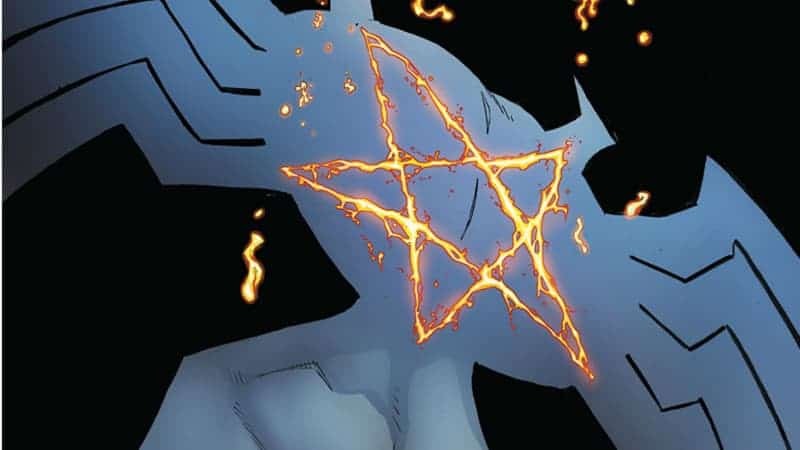 VENOM #8 feels different than any other issue of the series so far. It’s relatively light on action and huge reveals (save for the codex). However, it more than makes up for that in emotionally resonant, contemplative scenes with Eddie talking about Flash. I really felt for Eddie each time he spoke about the symbiote’s favorite hosts. It must hurt to learn that even though he was, in effect, the symbiote’s first real friend, he’ll still never measure up to someone who came after him. Cates makes Eddie incredibly sympathetic this issue, which I like. He isn’t always the most sympathetic character, since he’s been incredibly self-serving and cruel in the past. It works to humanize him more than he was in the past, especially during the ‘90s. Each scene where Eddie talks about Flash is a standout moment for the character as a whole. It also works well as a sort-of meta commentary on the popularity of Flash’s Agent Venom. Cates himself has said that the beginning of the issue also works as him speaking to Rick Remender, who initially wrote the original Agent Venom run. Beyond just Cates’ thoughts about being second to Remender, it also really works as commentary on when Eddie returned as Venom for Mike Costa’s run. Many fans were upset that Flash wasn’t Venom anymore, and they liked where Eddie’s characterization took him (making him an independent person who no longer needed his symbiote crutch). However, if this issue is any indication, Cates, and — by proxy — Eddie, proves that he’s worthy of carrying the VENOM torch. Iban Coello’s art during the eulogy scene really makes the issue go from awesome to truly memorable for me. The opening shot of Eddie looking contemplatively at the gravestone speaks volumes. Eddie’s pained, saddened face tells a story in itself. It shows how, even if he’s jealous of his place as favorite host, Eddie still cared about Flash. It truly hurt to see him go. The next panel really highlights Eddie’s grief. He practically looks like he’s on the verge of tears. 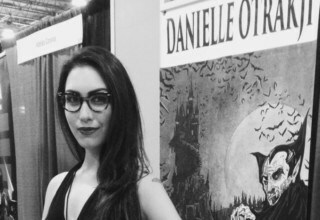 Coello’s art is the emotional core of the issue. It really sells Eddie’s words, and it shows that maybe he’s more grief-stricken than his words let on. VENOM #8 page 2. Image courtesy of Marvel Entertainment. VENOM #8 is a truly emotionally resonant issue. Cates does a spectacular job capturing Eddie’s complex emotions about Flash, as does Coello. It’s a must-read for any Flash Thompson/Agent Venom fans. Perfectly worded review and that issue was sooooo good. Agent Venom was my favorite Venom but Cates may change all that, if he keeps cranking out issues like this one. Thanks !